My two favorite times of the year in the Pampered Chef world are September and March ... when the new season of products comes out! Like usual the Pampered Chef did not disappoint with the new spring products. This season a bunch of the products got a new face lift and turned blue! We have the Cobalt Blue Color Coated Tomato Knife and the Cutting Board — Cobalt Blue to name just a couple. Of course all of those products would be the ones I already have ... you always need an upgrade right? I am super excited about the new additions to the Bamboo line. 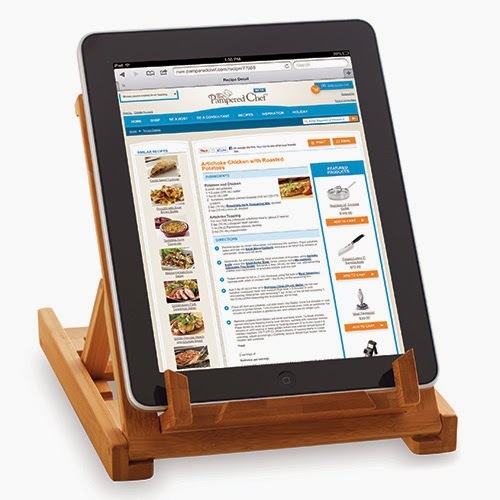 Not only do we have a large Bamboo Platter again but there are some great pieces to help around the house like the Bamboo Charging Station and my new favorite the Bamboo Tablet Stand which holds your cookbooks. 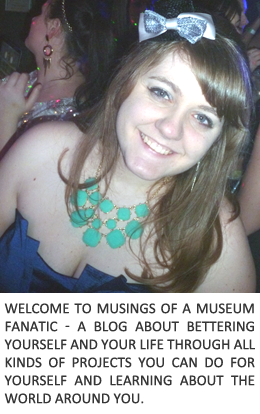 I am so insanely excited about the Tablet stand it's ridiculous. I've been hoping for a cookbook holder since I started and it is even better than I hoped since it's part of the bamboo line. This season the Pampered Chef came up with an entirely new line of products as well ... Gardening tools!! The Pampered Chef is extremely committed to bringing families together and since people are becoming more concerned with where their meals come from this category was a natural fit. Like any Pampered Chef tool these garden tools are top of the line with full tang construction and ergonomic grips these guys are going to wow the gardener in your house. Unfortunately for us I can't do a full on garden but I'm going to be trying my hand at herbs again and I know the Garden Trowel is going to be a huge help and a great all purpose one for my little balcony garden. Next month in April (just in time for Mother's day!) there will be special garden tool gift sets that include a special Garden Tote! Kevin has even been super excited about some of the new spring products ... the expansion of the On the Go pieces and now that some of them come in black and grey! Although I still don't see why he wouldn't want to rock out The Pampered Chef® On-the-Go Insulated Beverage Cooler — Paisley Dot? Silly boys! The one piece I know is going to have a fight over is the new The Pampered Chef® On-the-Go Trunk Organizer. As soon as Kevin saw it in the new catalog he wanted it, I will probably have to stash mine in my car immediately! 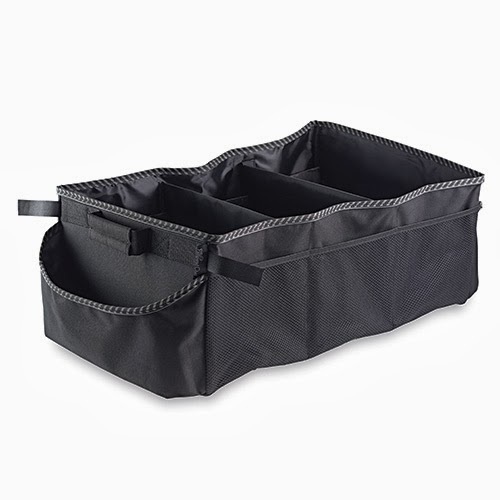 With three huge pockets that can be collapsed and multiple mesh side pockets for all your little items this guy is perfect for those in need of some serious car organization help. Plus with Velcro on the bottom this guy isn't going anywhere! The Pampered Chef has also come out with just some great new gadget type items. We've been using the new Mini Scoop 'N Drain and the oh so helpful Cord Wraps already. Pretty sure I need to get at least four more of the Cord Wraps to really get things organized but it's a good start. Maybe they should make bigger ones for my under the sink dryer and straightener cord messes. There are fun new products too, like our new "Batter Me Up" and "Stressed is Desserts ..." scrapers. Besides being a perfect size in great colors they have measurements on the reverse! Can you guess which color I got? These are just a few of the new spring products the Pampered Chef has for you this spring! Check out this video from the Pampered Chef YouTube page highlighting ALL of the new products. Be sure to let me know if you have any questions or if you want to get in on some great deals like the Garden Tool gift sets coming up in April. Oh, how I love Pampered Chef! I will definitely have to take a look at the Spring catalog. That batter thing is cute!